I took a chance on some untested micro components for this build to get an ultralight racer. This thing could have been sub-200g if I had went with the Hyperfloss 2204 motors, but I went for 2205 V2. I've put 10 batteries through the 20x20 stack with no issues, fingers crossed. My only complaint so far is that current sensing seems to be non-functional. I haven't been able to get it even close to calibrated. Cyclones are moderately amp hungry props, so I'm impressed with this little 4in1 esc. I did add a capacitor. We will see if it can handle the abuse of the track this weekend. The Eachine Vtx03 has proven to be a good little vtx. After doing some research to make sure it will actually broadcasted on 25mw, I gave it a shot. I'm powering it, and the camera, from the 5v regulator on the fc, and the video quality is perfect. Sorry if the scale is hard to read in the picture, it's 227.6 dry. Thanks for looking. I see you didn't use a heatsink on your ESC (which is apparently needed for the 25A rating according to Airbot). How did the ESC keep up? Any issues? I'm planning a similar build on a Tooth Fairy frame with the new Hyperlite 2205 2700kv motors and I'd like to use the Ori, too. I'll probably don't have enough space for the heatsink, though. Are you still happy with the Ori32 and this motors? DSHOT1200 works fine? I am thinking about to build the Floss 2 with the same ESC and motors but a different FC. What would you suggest are this components good, or would you reccomend some changes? It's still working great but it's the original Ori not the 32. 10/10 would recommend! Hi ROB very nice build ! 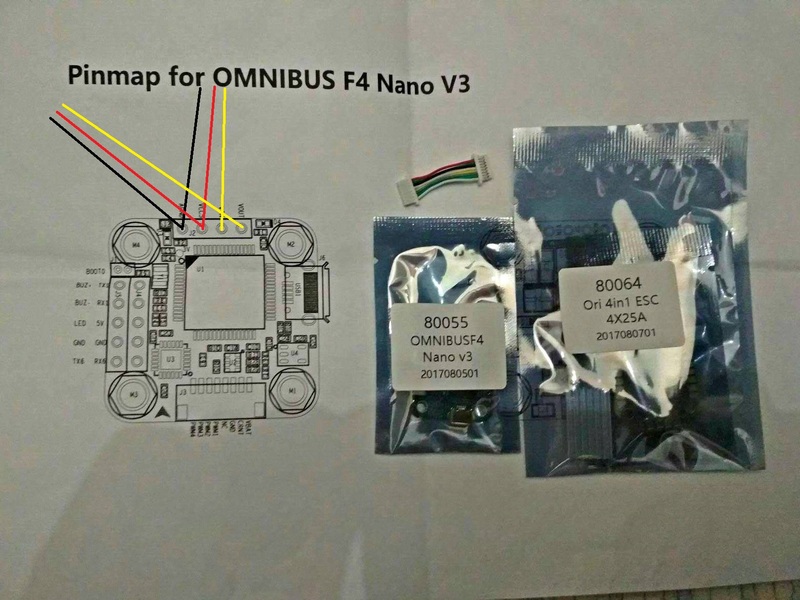 im building a super light 4" racer and i bought the new Omnibus F4 nano v3 LC and Ori 4in1 25A ESc . I also ordered the runcam Micro and eachine VTX03 , how do you wire the cam and VTX to the FC to get OSD ? Eachine VTX03 conected to the VIn & Vout + GRD & 5V of the FC Bec and the runcam micro connected to the VTX? also another question , if i use the 4in1 cable from the ESC to the FC it will also power the FC and i get OSD current sensor or do i need to power the FC from the VCC/XT60 ? Hi rob , did you conected VTX ground and camera ground to the FC Bec (ground) and also 5V VTX and 5V Camera to the FC Bec (VCC5) ? Yep, that's how I did it! just installed all !!! this escs suport dshot or i need to update blhesuite? also did you updated betaflight of omnibus F4 nano? Awesome! I always install the latest firmware on my fc and escs when I do a new build but that's up to you. Just make sure the motors are spinning the right way at least! will upload video next weekend ! thanks for the help ! Great stuff... I am going to do something similar but will be using the same FC and ESC combo. I have been staring at the ESC alignment and your "wires" pic. Did you move around the signal pins? When I visualize the build it looks to me like I would have to run the wires all over the place to get from, for example pad 4 to motor 4. Any advice or insight? You can remap the motor resources in Betaflight and solder whichever motor to whichever esc pads make the most sense. Awesome build! Did your Ori come with the heatsink? If it did, from the looks of it, it seems you didn't install it with the Ori. I'm trying to figure out if I should install it to the ESCs or not .. and how it would install too. Mine did not come with a heatsink. How is that pretty tucked-away VTX antenna placement working? I would think it needed to have more clearance from the frame? Thanks! I haven't had any problem with reception, if that's what your wondering. I haven't changed it from 25mw or swapped out the dipole antenna, but keep in mind, I am using a LaForge diversity module in my Fatsharks, which is exceptional. A short, comedic flight video. Came here to say: "UNBELIEVABLE! What an awesome and well built quad - it must just be insanely fast." But read your comment and thought I'd add: I find it incredibly frustrating that RTFQ descriptions are consistently off. Neither the FC nor the ESC have current sensing (as far as I can tell). The FC has an INPUT for current sensing so if your PDB or ESC was outputting scaled current values you could display that. But as it stands, the ESC does NOT have current sensing. When you enable current sensing on something like this you're just getting gibberish. There's no scaling value you can set to get an accurate reading. I mean neither the FC nor the ESC have a shunt resistor .... which every ESC/FC these days uses for current measurement. Maybe they're doing something else, but RTFQ has an error in pretty much every single one of their listings. Thank you, and yes it's incredible! You are absolutely right about the current sensor and RTF Quads. I came to the conclusion that the FC probably supports an external current sensor, but the ESC doesn't have one. The ESC is still working great after quite a bit of punishment, knock on wood. what cam mount is that? i want it! Thank you! I hope the esc holds up to the abuse of racing, fingers crossed! post video if you manage to get any! Wow! This build just blows me away... Nicely done.. Thanks. You've got some extra clean looking builds yourself. The effort put into those ESC wires shows though. Thanks. Flown about 10 batteries through it so far and it's holding up. Fingers crossed. Wow, that's a great price for such a light build. Nice work!